COLUMBUS, Ohio – For Mark VanFleet, down on the farm is actually a formerly vacant lot in a residential neighborhood on the South Side of Columbus. His one-half acre plot grows row upon row of vegetables, including lettuce, tomatoes, carrots, turnips, cucumbers, garlic, basil, dill, chard and kale. Known as Harriet Gardens, the lot provides enough for the full-time urban farmer to sell his produce to 15 local restaurants and at least three farmers’ markets. VanFleet is one of several growers that have graduated from the Ohio Master Urban Farmer workshop series offered by the College of Food, Agriculture, and Environmental Sciences at The Ohio State University (CFAES). 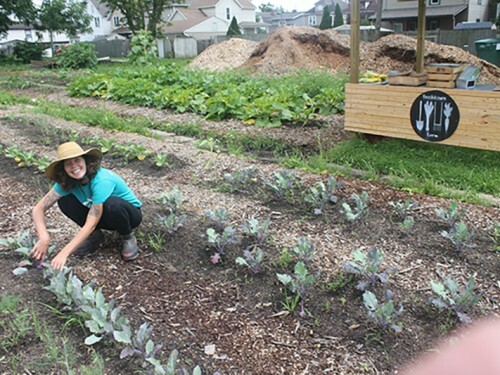 The intensive course, which was developed by Ohio State University Extension, the outreach arm of CFAES, teaches the basics of farming in an urban environment. Topics include soil testing for urban sites, choosing a farm location, basic plant science, marketing your produce, and most importantly, zoning and legal issues associated with farming in urban and residential areas. Agriculture is a booming industry in many urban centers across Ohio and nationwide, said Mike Hogan, an OSU Extension agriculture and natural resources educator who works with the program to increase the number of urban farmers. OSU Extension’s Franklin County office, along with the Columbus Urban Farmers Network, will host a free, public tour of five urban farms this summer to highlight the work urban farmers are doing and to educate consumers on the possibilities of urban farming, Hogan said. The Columbus Urban Farm Tour Series tours generally last about two hours and will take consumers from farms on the South Side of Columbus, to urban plots in Franklinton and the Linden area, to urban food enterprises on the East Side of Columbus. One of the farms on the tour will include Freshtown Farm, run by OSU Extension Ohio Master Urban Farmer alumna, Marcie Todd. Her urban farm is situated on a plot of land in Vassor Village near South High School that formerly housed three vacant homes. She now grows at least 70 different varieties of produce at the South Side location and on a larger plot she farms in Pataskala, enough to sustain a 30-customer Community Supported Agriculture business, as well as sell to several local restaurants and two farmer’s markets. Another benefit of urban farming is the boost that it offers neighborhoods, Hogan said. Vacant Lots Become Productive Urban Farms, July 14 from 10 to 11:30 a.m. at Magic House Farm, 120 N. Yale Ave., in Columbus. New Urban Farm in Residential Neighborhood, July 26 from 10 a.m. to noon, at Fresh Town Farm, 1282 Ann St., in Columbus. Urban Community Garden Serving Homeless Men, Aug. 19 from noon to 1:30 p.m. at Friends of the Homeless Garden, 924 E. Main Street in Columbus. Expanded Aquaculture and Vegetable Farm, Aug. 23 from 10:30 a.m. to noon, at Project AquaStar Farm at St. Stephens Community Center, 1500 E. 17th Ave., in Columbus. All the tours are free and open to the public. For more information on attending the tours or to learn more about OSU Extension’s Ohio Master Urban Farmer Workshop Series, contact Hogan at 614-866-6900 or hogan.1@osu.edu.